When we first learn about the main character in this musical, it's through an antique schoolyard rhyme: "Lizzie Borden took an axe / She gave her mother 40 whacks / When she saw what she had done / She gave her father 41." In the real world, back in 1892, Borden was acquitted of the gory double murders that happened at her home in Fall River, Massachusetts. And the actual number of whacks, for Lizzie's dad and stepmother combined, was less than 30. Notwithstanding the uncertainty of her guilt — and the poetic license taken in her song — Lizzie remains the legendary prime suspect. But the action hero of a hard-rock musical? Writer and director Tim Maner and songwriter Steven Cheslik-DeMeyer had that idea in 1990. Putting together four songs and staging their experimental rock theater production in SoHo, the duo originally called the confection Lizzie Borden: An American Musical. Over the next 13 years, the work was retooled, fitfully revived and workshopped. New songs were tacked on, the skeletal storyline was fleshed out and Alan Stevens Hewitt joined the writing team. As it grew to a full-fledged two-act musical, the title became leaner. And now Lizzie is rockin' the Queens University campus, transitioning from previews to its official Actor's Theatre of Charlotte opening this week. From the musical's beginnings, Lizzie has always featured four women in the singing roles. Aside from the legendary slayer, there's Lizzie's elder sister Emma, next-door neighbor Alice Russell and housemaid Bridget Sullivan. Actor's Theatre is taking it further — presenting an all-female edition. The sextet of instrumental slayers joining the cast onstage at Hadley Theater will be women. Ditto the design team, the choreographer, the music director, the stage manager and the stage director. Cue actress and Chickspeare co-founder Joanna Gerdy, who's strayed into crass and bloody musicals before, directing Little Shop of Horrors and Bonnie and Clyde. Now, she's overseeing the slashing score of Lizzie. "I love the music in this show," Gerdy gushes. "And what's not to love? Think Heart, Joan Jett, The Runaways, Stevie Nicks ... you get the idea! Lizzie runs the gamut from catchy melodic storytelling, to outrageous punk-rock anthems, to evocative ballads. There are head-banging moments juxtaposed with gut-wrenching stillness. There are lyrics straight out of Macbeth, and in fact, a Weird Sister vibe throughout." 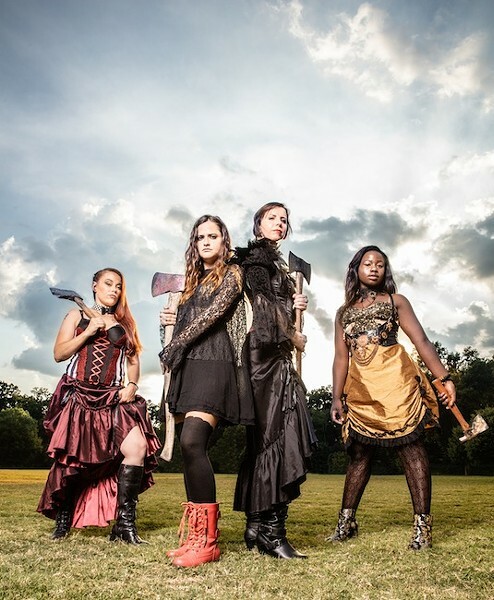 Lizzie cast members (from left): Rachel “Shea” Shipley, Katy Shepherd, Kristin Jann-Fischer and CiCi Kromah. The schoolyard skip-rope song was all that had ever grabbed Gerdy about Borden when Actor's Theatre artistic director Chip Decker asked her to take the reins. She was happy to find that the familiar rhyme starts off the evening, setting the creepy tone. But it still wouldn't be worth the effort for Gerdy if things didn't get serious before they got gory. "Lizzie unlocks the doors in the House of Borden, shows us what may have been going on behind them, and we can't help but feel for this desperate, powerless girl," Gerdy says. "Women were living under a harsh Victorian moral code, and Lizzie Borden was likely trapped inside a house hiding even more heinous goings-on. For me, this play gives powerful voice to women in a time when they were often voiceless and powerless." The biggest mystery Lizzie will explore, with ever-increasing decibels, isn't the question of whether this New Englander committed these horrific crimes, but why. What could have brought so much stress and pressure on poor Lizzie? "From the moment the audience walks in," Gerdy says, "they should feel totally creeped out, unsettled, off-balance — that feeling that something bad is already happening, and it's going to get worse. And when it does, it will rock your face off! As the story intensifies and the patriarchy is smashed, the women are empowered to literally shed the trappings of their Victorian entrapment." Actress Katy Shepherd can closely identify with Lizzie's feelings of powerlessness. After splashing down sensationally in Charlotte, romping around ImaginOn in the title role of Lilly's Purple Plastic Purse for Children's Theatre, and following that up with more grownup triumphs, Shepherd experienced a nightmarish 2016. Stricken by celiac disease coupled with severe anemia, she underwent surgery five times. Shepherd knows what it means to feel trapped. "Every day I can walk, let alone perform, is such a gift," Shepherd says. "American Idiot [with Actor's Theatre last season] was my first show back with a healthy body, and our wonderful choreographer Tod Kubo even remarked on how my dancing had even improved since our last show together. I feel so present and grateful being healthy, and any role that I play now will have a touch of that." 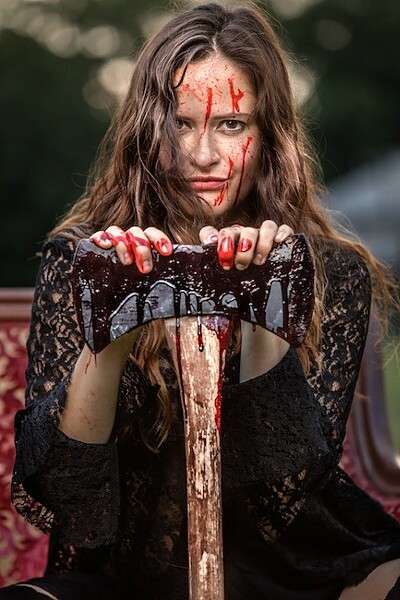 Katy Shepherd as Lizzie Borden. Gerdy hadn't met Shepherd before auditions and had no knowledge of her back story. Knowing where the actress had come from to get where she is now had nothing to do with why Gerdy was impressed. Seeing Shepherd in the moment was enough. "Katy's vocal power blew me away," Gerdy remembers. "At the auditions, I found myself spending a lot of time watching what people were doing when they weren't singing or performing. And that's what tipped the scales for me: She was always compelling, even — or perhaps especially — in the moments when she was listening and just being. She made me care about Lizzie and want to watch her, listen to her and root for her. And those eyes. She can shift from vulnerable to vixen in the blink of an eye — literally." That spark manifests itself in the range of emotions Shepherd is called upon to project as Lizzie — not to mention in some pretty insane vocals. "Every song is one to brace yourself for," Shepherd warns. "This music delivers in a way I have never experienced before. From abuse, to murder, to seduction, to betrayal — it's all there. And it all rocks." Taking on Lizzie, Shepherd had only three days off in July, and before rehearsing seven days a week until 10 or 11 p.m., she holds down a full-time day job teaching at Children's Theatre's summer camp. Gerdy has been keeping track, imagining the extra time Shepherd devotes to learning lines, absorbing the music and refining her portrait of a legend. What's more, Gerdy notes, "She has done all of this during her first pregnancy. She's a force; I'm in awe of her, and am incredibly grateful to have had this opportunity to work with and get to know her." So we finally arrive at the question no journalist can shirk when confronting an esteemed actor who has penetrated the deepest recesses of Lizzie Borden's soul and lived there for more than a month. To put it bluntly: Was Lizzie a lesbian? "Considering that there are only women in this show," Shepherd says, "and you've always got to have a love story — I'll let you do the math!"